Villa Sigurata consists of 3 restored 15th century small stone houses in the center of the Old Town of Dubrovnik. Our tastefully decorated old town houses provide guests with the perfect pied a terre from which to explore the city and the surrounding area. Located 5 minutes walk away from the nearest beach and excursion points, staying here would enable you to blend in with the local neighborhood, thereby providing a unique travel experience. 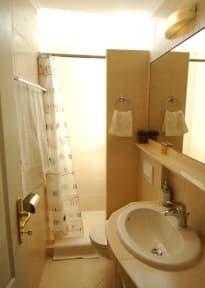 We have Double Rooms Private Ensuite, Double rooms private (shared bathroom), apartment for 3, apartments for 6. The rooms are air-conditioned, SAT TV. There is mini kitchen, laundry service. We can arrange pick up service from or to the airport. Come as a guest and leave as a friend! Amazing place in a wonderful location! Romana and her family were so helpful and welcoming. They arranged all our transfers and let us know where all the good restaurants/cafes were in the old city. My Dubrovnik stay was a highlight. Romana’s welcome set others apart. So warm & hospitable. So quick to offer knowledge & assistance. accommodation was very comfortable & in a good location. I would stay again. After I left and was on an island, Romana contacted me as I had left valuables behind. She must have spent a lot of time researching & arranging, confirming with multiple parties & updating me all the time. This angel had my belongings to me that same day. Impressive!! Loved our 3 day stay in the old town of beautiful Dubrovnik A quiet location tucked away but near the start of the Game of Thrones Walk of Shame! so a stones throw from all the action. Great communication prior to arrival on how to find the office and options on leaving of where to leave the key. This place was excellent! My fiancé and I had booked a private room with a shared bath, but they upgraded us to the private apartment because there was availability. IT WAS SO COOL. Right ne t to the city walls, so close to a couple of the bars on the cliffs outside the walls, and the place was clean and cozy. I would definitely stay here again when we come back to Dubrovnik! Can't beat the location! Staff was super helpful. Bed was very comfortable. Everything was absolutely perfect!!! Highly recommended. Very comfortable bed. My husband and I (50’s) and daughter (23) all stayed in 1 room. Lady of the house washed and folded our cloths for us as well. Romana fue muy amable y nos ayudó en todo. Estuvo muy atenta a todo lo que necesitamos y siempre dispuesta a hacer todo más fácil para nosotras. La ubicación es increíble, dentro de la ciudad amurallada, por lo que todo es a unos minutos caminando. Muy recomendado. Quedamos muy felices. Good location and mostly clean, but a few strange things here. 1) They kept coming in and opening up all the windows, even when I closed them. There are no screens. With all the cats, birds, and insects outside, I did not want the windows open, but every time I came back after being gone, they were open again. 2) The bathroom window is huge and has no shades. Anyone in the building next door can see you showering or using the toilet. 3) Had to ask for pans for stove. 4) Towels were old.